This villa is on a large estate with beautiful, extensive gardens, a luxury swimming pool and spectacular views over the surrounding area. 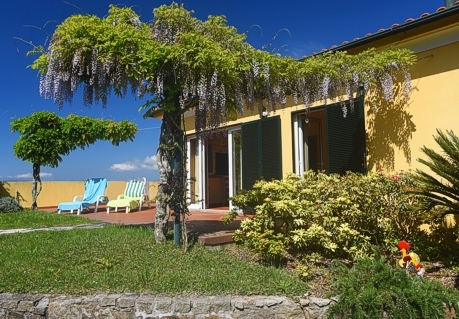 It shares this estate with another villa, residence of the owner. This property is ideal for a young family or a couple who want to relax in the beautiful gardens and enjoy the facilities, whilst being within walking distance to a charming town and close to fantastic beaches. This cosy villa is traditional in décor. It is a single story villa, however there is the option to also hire an extra room on the lower ground floor. An open plan living/dining room is the heart of this villa and a small fireplace surrounded by 2 sofas makes it especially cosy. The dining area seats up to 6 people comfortably. In summer months guests can enjoy the additional living area offered by the private terrace which is accessed from the living room. 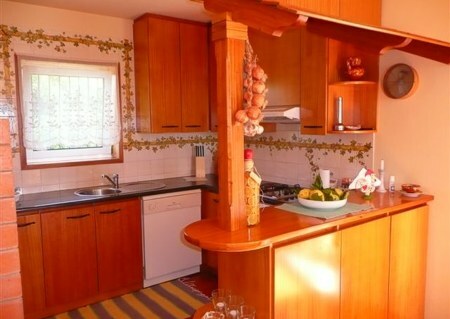 The fully fitted kitchen offers all the appliances you will need during your stay. 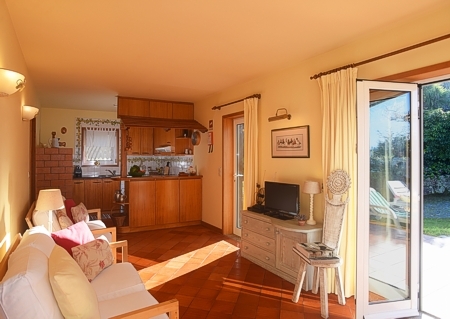 This villa has one double bedroom, a twin bedroom (this has a single bed and a pull out bed - this room is suitable for children) and a family bathroom. Both bedrooms have lovely views. The lower ground floor has an additional double bedroom (which can sleep up to 3 people), a separate living area, a shower room and access to a further private terrace with a table and chairs. 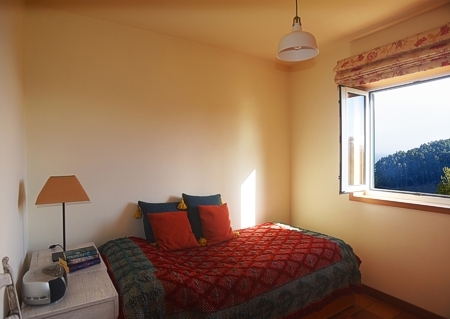 This area cannot be rented separately from the main accommodation on the floor above. This villa’s large private terrace offers ample space to enjoy the long Portuguese summers and is the ideal place for outdoor dining, complete with a barbecue area. 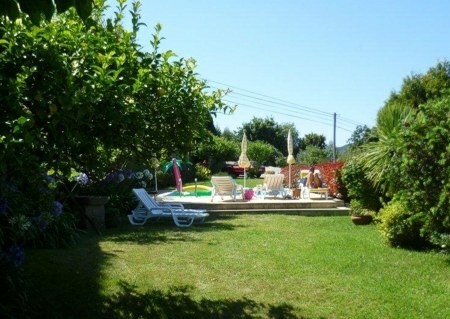 The villa is surrounded by a large, extremely well maintained garden, with olive, oranges and lemons and sweet chestnuts trees in abundance. 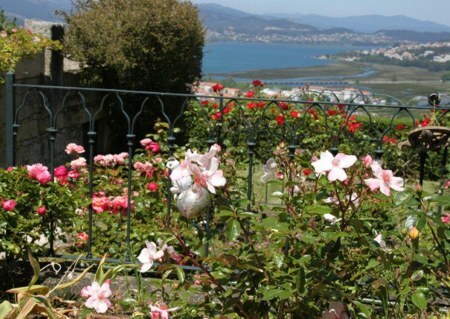 There is also a beautiful rose garden and it benefits from uninterrupted views over Caminha, the Minho and Coura rivers, and Spain in the North. The swimming pool is a good size and there are sun loungers and parasols available. 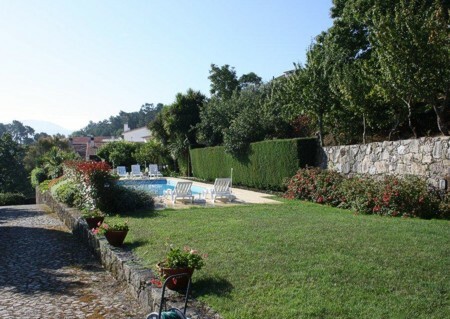 Casa do Castanheiro is within walking distance from the ancient fortress town of Caminha. Proudly situated facing Spain at the mouth of the River Minho, this town has been inhabited since Celtic and Roman times. There are also a number of great beaches nearby, including a lovely beach 2 kms away - this is one of the most beautiful in North Portugal with pine woods opening onto a long and white stretch of sand. 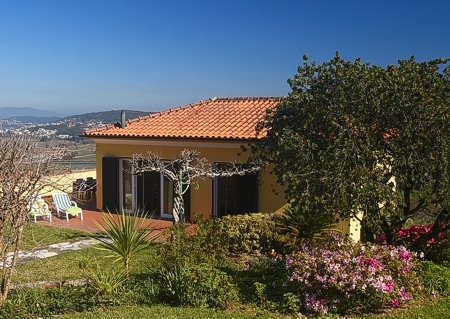 Casa do Castanheiro is ideally situated for exploring the many delights of the Minho region, including the Peneda-Geres National Park, the walled border town of Valenca and the old sailing city of Viana do Castelo. The magnificent Spanish cities of Vigo, Baiona and Santiago de Compostela are also within easy reach, as are the large Portuguese cities of Braga and Porto. The nearest golf course, the Ponte de Lima course is approx. 40 kms away. Over more than two decades I visited the Algarve for holidays starting when many of the coastal sprawling developments of today were tiny fishing villages. In seeking to recapture those years of few tourists and a more peaceful and less commercial Portugal I looked north and found Casa do Castanheiro. The website description is pitch perfect. The cottage is comfortable and the setting within the garden can hardly be bettered. 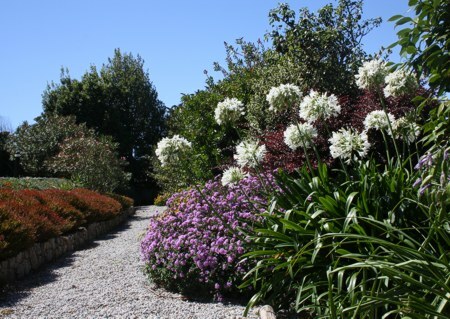 The garden has been landscaped over the years by the owner starting from a neglected and over grown property with a small cottage in a dilapidated state. One looks down with a bird's eye view of teh ancient small towns of Caminha with the twinkling lights at night lighting up the skyline. The view extends to the large expanse of the River Minho which joins Portugal with Spain via a regular ferry service. For children there is the pool and lawn space to play games and let off steam. A fine long sandy stretch of beach is within just a few kilometres and easily accessible. 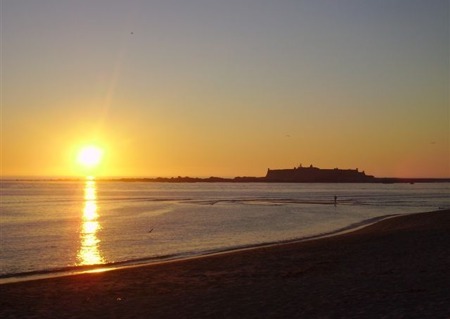 Caminha with its ancient square offers small cafes and restaurants, and there is a typical Portuguese fresh vegetable, fruit and fish market. Casa do Castanheiro has been a happy find. Comment posted by Simon R.
I've managed to clear my head after travelling back yesterday. The weather change from a 30 C Porto to a 15 C London which was a relief and a shock. Doubtlessly it is also cooler in Austria, my favourite place to ski ( I was St Christof in March). You haven't got a chalet in the Alps, as well!!! As a family can I say what a pleasure it was to stay in the main house. We are not used to such grandeur. I was concerned that my two sons (17 & 20) who can be accident prone would break a family heirloom but I think we managed to avoid that. 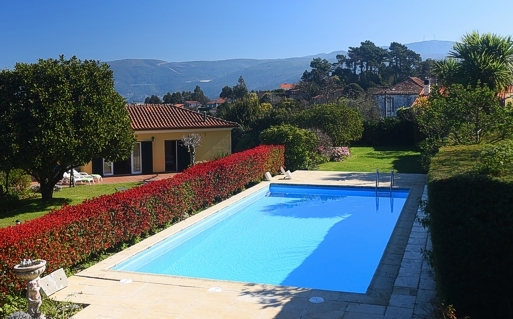 I would recommend any of my friends to visit Caminha and stay at either the cottage or house. However, the walk into town and back might prove a bit arduous for some. We appreciated the shopping that was provided especially as the plane was delayed and thank Adilia and her husband,again,for staying so long. Everything was so spotless when we arrived including the pool. Ideas/Comments: Beaches - Foz do Minho. Estuary beach for small children but likely to have waves for older children on the Atlantic beach. 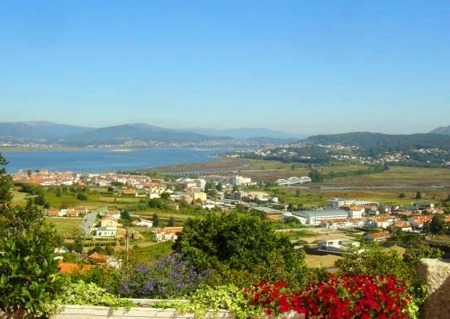 Restaurants - could recommend a few and say what type of cuisine like Pero da Caminha Italian Sightseeing - Valenca (fortress/shopping), Soajo (hill village), Viano da Castilo (Chapel and view from the hill), Ponte da Lima or even Santiago da Compostela (Cathedral). All places we visited. We had no idea whether a text sent to you on the first day about us being late reached you. I assume that it didn't and we needed a Portuguese SIM card. You could mention this to the technological illiterate like ourselves. It was our great luck to find your house on the internet as it resulted in a memorable holiday for all four of us. Thanks.